Set during and after the First World War, A Very Long Engagement tells the story of a young woman's search for her fiancé, whom she believes might still be alive despite having officially been reported as "killed in the line of duty." Unable to walk since childhood, fearless Mathilde Donnay is undeterred in her quest as she scours the country for information about five wounded French soldiers who were brutally abandoned by their own troops. 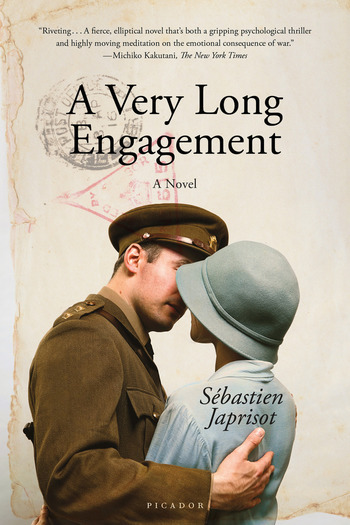 A Very Long Engagement is a mystery, a love story, and an extraordinary portrait of life in France before and after the War. Once upon a time, there were five French soldiers who had gone off to war, because that's the way of the world. Sébastien Japrisot was the pen name of Jean Baptiste Rossi. He wrote seven novels, including One Deadly Summer, The Sleeping Car Murders, The Passion of Women, and The Lady in the Car with Glasses and a Gun.